Offering you a complete choice of products which include waste segregation system 2 bin (30 ltr). By employing our years of practice, we bring forth a qualitative series of bulk Waste Segregation System 2 Bin (30 Ltr) that meets on industry demand. Stainless Steel / Mild Steel trolley on castors. Foot operating system for touch-less opening of lid. 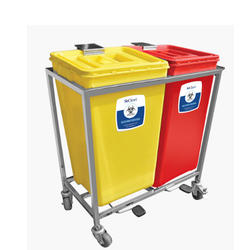 The Bins comply UN and NFX Standards of safety. Available in One Bin, Two Bins, Three Bins & Four Bins Trolley Options.